How Do You Become an Emergency Room Nurse? If you’re looking for a fast-paced nursing career in critical care, you should consider taking the steps to become an emergency room nurse. ER nurses are licensed registered nurses who specialize in treating patients facing acute injuries, critical illnesses, and trauma. ER nurses assist doctors during emergency medical treatment by monitoring vital signs, administering drugs, operating equipment, and informing family members. Emergency room nurses often deal with life-threatening conditions, including heart attacks, strokes, and respiratory failure. Modern Medicine has named ER nursing among America’s seven fastest-growing specialties. Nursing jobs in emergency rooms are expected to grow by 26 percent over the next decade. Below is a step-by-step guide on how you can become an emergency room nurse. First, you must complete post-secondary training in nursing to become an RN. Most states allow three educational routes for achieving this licensing. You could complete a hospital-based diploma, two-year Associate of Science in Nursing (ASN), or four-year Bachelor of Science in Nursing (BSN). The AACN now recommends that a bachelor’s degree be the minimal preparation for registered nurses though. Make certain that the college or university is properly accredited through the CCNE or ACEN. During your clinical rotations, start spending time in emergency rooms and other critical care settings for experience. Upon graduation, you’ll have the qualifications to pursue RN licensing from your state’s board of nursing. Passing the National Council Licensure Exam (NCLEX-RN) will be required. This test is primarily multiple-choice questions to assess your competency for safe nursing care. Once you pass, you can begin applying for entry-level jobs in staff nursing. Build your resume with critical care experience to advance into ER openings. Taking training for advanced cardiac life support (ACLS), cardiopulmonary resuscitation (CPR), and the trauma nursing core course (TNCC) is advised. With at least two years of emergency nursing experience under your belt, it’s time to pursue professional certification. Although not required, certification is highly suggested to enhance your credibility, confidence, and commitment in the specialty. Through the Board of Certification for Emergency Nursing (BCEN), you can obtain the Certified Emergency Nurse (CEN) credential. Currently, over 30,850 nurses hold this certification. You’ll have to pass a computerized exam at a Pearson Professional Center. Renewing your CEN credential every four years with continuing education is required. Emergency room nurses seeking to move into advanced practice nursing (APRN) roles can forge ahead to graduate school. 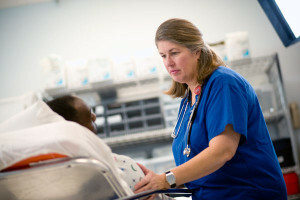 Master of Science in Nursing (MSN) programs take just two to three years and can even be completed online. If you don’t have a bachelor’s degree, RN-to-MSN programs also exist. Having a master’s degree equips nurses for becoming ER nurse practitioners or clinical nurse specialists. These APRN jobs come with better salary, higher responsibility, and greater practice independence. An MSN will satisfy the ANCC’s requirements for the Adult-Gerontology Acute Care NP certification too. Overall, emergency room nurses play a pivotal role in providing fast, competent care to patients experiencing acute or critical conditions. Their work builds the foundation for high-quality treatment in hospitals, urgent care centers, crisis intervention centers, medical transport companies, poison control facilities, and even prisons. ER nurses have a median yearly salary of $60,846 according to Payscale. If you become an emergency room nurse, you’ll have the rewarding chance to deliver the rapid assessment and care that saves lives.